Perma "archival" plat cabinet envelopes are made of a full 6 mil. advanced polyolefin material. These thin, incredibly strong plat envelopes are chemically stable and GUARANTEED safe for all types of documents. They are available in two popular styles. Regular with zippers (eyeleted to hanger) and Wishbone style (to be used with wishbone hangers). Note: Mylar envelope are also availabe in 4 mil. Permanenetly eyeleted to hanger bar. Zipper closure allow easy access. Attach to wishbone hanger with screw posts (sealed on 3 sides & punched). PDegned to hang wishbone envelopes using screw posts. For envelopes without hanger deduct $5.50 each from above. Acid Free Tag Filler (jute) included in price. For envelopes without hanger punching deduct $ .40 each from above. Acid Free Tag Filler (jute) included in price. $ .40 each from above. $ .80 each from above. Perma "archival" plat book envelopes are used in conjunction with Enduro Plat Binders. They are made of a full 6 mil. advanced polyolefin (Polypropylene) material. These thin, incredibly strong envelopes are chemically stable and GUARANTEED safe for all types of documents. Note: Mylar (polyester) envelopes are also availabe in 4 mil. (recommended for plats) and 2mil. 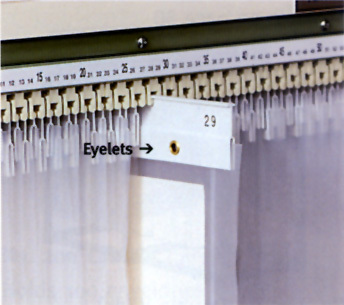 pockets (recommended for encapsulation) Call or email for prices. CENTER TO CENTER OR C-C  The distance between the center of one binder post to the center of another. This measurement is needed to determine hole or post spacing (See Below). OUTSIDE CENTERS  Center to Center of the two outermost posts, each on opposite ends of the metal (See Below).